To evaluate the corneal biomechanical changes due to small incision lenticule extraction (SMILE) measured by Scheimpflug-based dynamic tonometry and to assess the impact of the corneal thickness. Sixty-eight patients measured with the Corvis ST (Oculus Optikgeräte GmbH, Wetzlar, Germany) preoperatively and 1 month after SMILE were included in this retrospective observational study. Patients were divided into three groups depending on the preoperative spherical equivalent: low from −1.00 to −3.00 diopters (D), medium from −3.25 to −5.00 D, and high from −5.25 to −7.25 D. Changes in Corvis ST parameters due to the surgery were analyzed and new indexes for correcting the impact of corneal thickness were proposed. First and second applanation times changed after SMILE (P < .0001) but no differences were found in the comparison between these relative changes (P = .31). First applanation time was correlated with central corneal thickness (r = 0.368, P = .002) but not second applanation time (r = −0.149, P = .23). The change in first applanation time due to SMILE was different among myopic groups (P = .007) but equal when a new index that considers the removed central corneal thickness was used for comparison (P = .31). Deformation amplitude was also increased after SMILE (P < .0001), but after subtracting the removed corneal thickness from the postoperative deformation amplitude the result was equal to the preoperative deformation amplitude (P = .26). SMILE produces significant changes in the Corvis ST parameters of time and deformation amplitude, but these changes are mainly explained by the confounding variable of corneal thickness. Corneal biomechanics is of great importance in laser refractive surgery because it can affect the prediction of clinical outcomes1 and might be related to the development of corneal ectasia after surgery.2 Although it has still not been widely incorporated in clinical practice for screening purposes, the fact that postoperative ectasia can occur without apparent preoperative risk factors with current technology3 has led to a growing interest in new clinical methods for assessing corneal stiffness. Furthermore, Reinstein et al.4 hypothesized that the new technique small incision lenticule extraction (SMILE) may better preserve stromal tensile strength compared to previous laser techniques such as photorefractive keratectomy and LASIK because of the absence of a flap and the fact that the stiffer anterior part of the cornea remains intact. Therefore, clinical studies have focused on comparing the cornea response after each of these procedures.5 Agca et al.6 used the Ocular Response Analyzer (Reichert, Inc., Buffalo, NY) to measure the corneal hysteresis and corneal response factor parameters and did not obtain significant differences between SMILE and femtosecond laser-assisted LASIK. Conversely, Dou et al.7 found that SMILE seemed to have less effect on corneal biomechanics than LASEK in terms of per unit tissue removed and El-Massry et al.8 reported that postoperative corneal hysteresis and corneal response factor parameters were dependent on the lenticule depth in patients who had SMILE. A new instrument named Corvis ST (Oculus Optikgeräte GmbH, Wetzlar, Germany) provides more parameters that might be related to corneal biomechanics, but comparison of techniques with this new instrument remains controversial. Hassan et al.9 reported no differences after photorefractive keratectomy and LASIK in comparison to preoperative data in almost all of the Corvis ST parameters analyzed, but this is not in agreement with other preoperative–postoperative studies using LASIK.10 Chen et al.11 reported differences between photorefractive keratectomy and virgin eyes, but Pedersen et al.12 found no differences between control and LASIK, femtosecond lenticule extraction, or SMILE groups for all parameters except AT1 deflection length. Shen et al.13 measured with the Corvis ST just after lenticule creation and later after extraction, and discovered that Corvis ST parameters changed significantly only during extraction. The aims of the current study were to evaluate the biomechanical changes of the cornea after SMILE and to analyze the impact that the removed corneal thickness may have on the most repeatable Corvis ST parameters. New indexes that consider the removed corneal thickness have been proposed for future comparisons between refractive surgery techniques. Patients operated on with the SMILE technique between January 2014 and January 2016 at Qvision (Department of Ophthalmology, Virgen del Mar Hospital) were identified in this retrospective observational study. The procedure was explained to all of the patients, who signed the preoperative informed consent. Institutional review board approval was obtained and the study complied with the tenets of the Declaration of Helsinki. Inclusion criteria were myopic patients with spherical equivalent from −1.00 to −7.25 diopters (D) and refractive astigmatism less than 3.00 D who were measured preoperatively and 1 month after SMILE with the Corvis ST. Preoperative exclusion criteria were pregnancy at the time of surgery or follow-up, a preoperative central corneal thickness of less than 480 µm, an expected postoperative residual stromal bed of less than 250 µm, a topographic map compatible with subclinical keratoconus or other ectatic corneal disorder, and any other ocular disease for which laser refractive surgery procedures are not indicated.14 Postoperative exclusion criteria included intraocular pressure (IOP) greater than 19 mm Hg before or after SMILE, central corneal thickness (CCT) greater than that before the surgery, postoperative complications, and patients who had undergone a laser re-treatment. Measurements by the Corvis ST with alert messages of “pressure profile” and “lost images,” which indicate poor quality, were also excluded. However, other alerts such as “model deviation,” “lost points,” and “alignment” were not discarded after consulting with the Corvis ST manufacturer about the possible influence of these alerts on the results. The same surgeon (JF) performed all SMILE treatments with the VisuMax femtosecond laser system (Carl Zeiss Meditec AG, Jena, Germany). Two drops of topical anesthesia (oxybuprocaine hydrochloride 0.4%) were instilled at 5 minutes and two additional drops at 1 minute before surgery. In patients requiring astigmatism correction greater than 1.50 D, corneal reference marks were made before surgery at the 3- and 9-o'clock meridians with the patient standing up. The optical principles and general description of the SMILE procedure have been widely described,15 but some particular laser settings or surgical maneuvers were used. Before suction, centration was accepted when the ring of the applanation zone was concentric with the margin of the cone and near to the pupil center.16 Suction was then applied, and a slight rotation of the applanation cone was made to compensate for cyclotorsion in cases of high astigmatism with markings, taking as reference the horizontal lines seen through the microscope. The photodisruptive procedure occurs in the following sequence: (1) posterior lenticule creation from periphery to center (optical zone of 6.5 mm); (2) transition zone after the peripheral optical zone greater than 1 mm of the optical zone; (3) anterior lenticule from center to periphery with a cap diameter of 7.6 mm and cap thickness of 140 µm; and (4) peripheral incision of 2 mm with 30° of angle for posterior lenticule extraction at 70°.17 In SMILE, the cap depth is theoretically constant across the anterior surface of the lenticule and the depth of the posterior lenticule surface is established by the software depending on the attempted refractive correction. Laser configuration parameters were: repetition rate of 500 kHz, spot distance of 4.5 µm for the lenticule and 2 µm for its border, and pulse energy of level 30 in the software, which corresponds to approximately 150 nJ.18 The target refractive error correction was directly inserted in the software without applying any nomogram. After laser treatment, the patient was moved to the surgical microscope for the second part of the procedure, which involves: (1) delineating front and back lenticule surfaces; (2) surface separation using the standard lamellar corneal surgical technique of moving the instrument back and forth using a blunt circular tip (Femto Double-Ended instrument [G-33954]; Carl Zeiss Meditec AG) starting with the complete dissection of the front cap and following with the dissection of the posterior lenticule surface; (3) lenticule extraction with forceps (Lenticule Forceps [G-33961]; Carl Zeiss Meditec AG); and (4) pressing the corneal surface from center to periphery using a dry micro-spear and drying the incision with the same. Finally, two drops of combined tobramycin (0.3%) and dexamethasone (0.1%) were instilled in all cases at the end of the procedure. Postoperative treatment included ofloxacin (0.3%) for 2 days, dexamethasone drops five, three, two, and one time per day (reducing the dosage every 7 days), and sodium hyaluronate (0.15%) for 1 month. Corneal biomechanical parameters widely described in the literature were obtained by the Corvis ST.11,19 This system is based on the concept of dynamic corneal topography, which combines the bidirectional applanation technology, the high-speed photography, and the corneal topography.20 An air puff is directed over the cornea and its response is captured by a Scheimpflug camera with a frame rate of 4,330 frames per second along an 8-mm horizontal corneal coverage.21 Multiple data are returned during the three stages into which the process can be divided: inward applanation (AT1), highest concavity, and outward applanation (AT2). The CCT output from the Corvis ST was also used for the analysis because previous studies have reported non-significant differences or no trends to overestimation or underestimation compared to the values obtained with the Pentacam system (Oculus Optikgeräte GmbH, Wet-zlar, Germany)19 or ultrasound pachymeters.22 A good intraobserver repeatability has been reported for only some variables, including IOP, CCT, AT1, and AT2, and maximum deformation amplitude (DA) at the corneal apex.11,23 On the other hand, poorer intraclass correlation coefficients have been reported for peak distance, time from starting until highest concavity, and first/second applanation lengths or velocities.11,21,23 Therefore, only the most repeatable variables (AT1, AT2, and DA) were included in this study, for which only one measurement per eye was taken. Other variables such as air puff pressure at both applanation times were also considered due to their potentially high clinical relevance for the analysis even though their repeatability has not been previously reported. Because measurements were repeated for each eye 1 month after SMILE, these postoperative measurements are identified by an apostrophe in the text (ie, AT1′, AT2′, and DA'). Relative time changes due to the procedure were also computed for first (diffAT1 = AT1 – AT1′) and second (diffAT2 = AT2 – AT2′) applanation times. A new variable named corrected DA (DAc) was computed for DA by subtracting the CCT tissue removed by the procedure from DA' (DAc = DA' – (CCT – CCT')). DAc was computed because it is known that the Corvis ST parameters depend on corneal thickness.24 For the same deformation at the posterior corneal surface, the anterior surface is going to experience a greater depth due to the removed CCT, as described in Figure 1. Only the right eye of the patients was included in the statistical analysis, except if this eye showed one of the alert messages included in the exclusion criteria. In such cases, the left eye was included instead of the right eye. Normal data distributions were confirmed with the Shapiro–Wilks W test for the comparison between groups and with the Kolmogorov–Smirnov test for differences between preoperative and postoperative variables. Paired t tests were conducted for testing differences before and after the procedure and Pearson r for evaluating correlations. The sample was divided into three groups according to the myopia level: low from −1.00 to −3.00 D, medium from −3.25 to −5.00 D, and high from −5.25 to −7.25 D. A one-way analysis of variance with Bonferroni-adjusted post hoc comparisons was used to evaluate the differences in variables among the three myopic groups. Data were analyzed using SPSS for Windows statistical software (version 20.0; SPSS, Inc., Chicago, IL) and all of the statistical tests were selected after checking that the required assumptions were completely accomplished. Sample size calculation was performed to confirm whether the sample of eyes included in the current study was of adequate size using the software PS version 3.1.2 (free availability online: http://biostat.mc.vanderbilt.edu/wiki/Main/PowerSampleSize). This software uses the Dupont and Plummer approach for sample size calculation.25 We estimated the number of pairs of patients needed to detect a true difference in population means δ with type I error probability α given a standard deviation σ. Specifically, for a statistical power of 80%, considering δ and σ changes after SMILE reported for DA, AT1, and AT2 in previous studies,9–13 and an α error of 0.05, the sample size required was 61 eyes. Eight eyes were excluded from the study for the following reasons: 3 eyes had an IOP greater than 19 mm Hg before or after SMILE, 4 eyes had higher CCT after SMILE than before surgery, and the Corvis ST pressure at AT2 was 164 mm Hg in 1 eye, which was considered as an outlier. A total of 68 eyes of 68 patients distributed in 25 low, 32 medium, and 11 high myopic eyes were included in the analysis (Table 1). Table 2 shows the changes in preoperative and postoperative variables. AT1 was advanced and AT2 was delayed significantly after SMILE, whereas highest concavity did not vary. The difference between the relative changes at first and second applanation times due to SMILE was not significant, neither for times (|diffAT1| – |diffAT2|) nor for Corvis ST pressures (|diffPA1| – |diffPA2|). We found a significant correlation between AT1 and CCT that increased after SMILE (Table A, available in the online version of this article). However, no significant correlations were found between AT2 and CCT before and after the surgery or for simulated keratometry with AT1 and AT2 (Table A). The proposed biomechanical indexes were 5.26 ± 3.95 (range: −5.49 to 15.58) for t1 and −5.79 ± 6.32 (range: −22.04 to 13.02) for t2. These indexes among refractive error groups are detailed in Table B (available in the online version of this article). 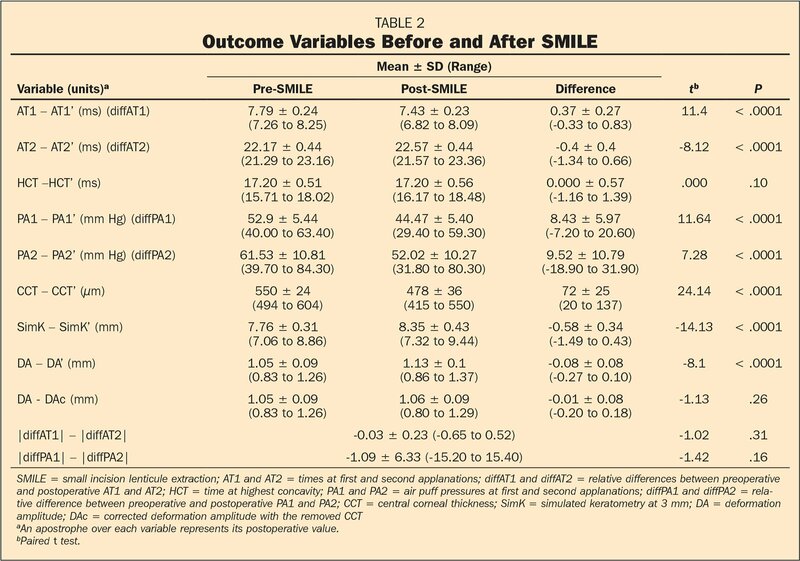 Table 2 shows how DA was increased significantly after SMILE. However, when the removed CCT was subtracted from the DA' (DAc), this difference between preoperative and postoperative DA disappeared. 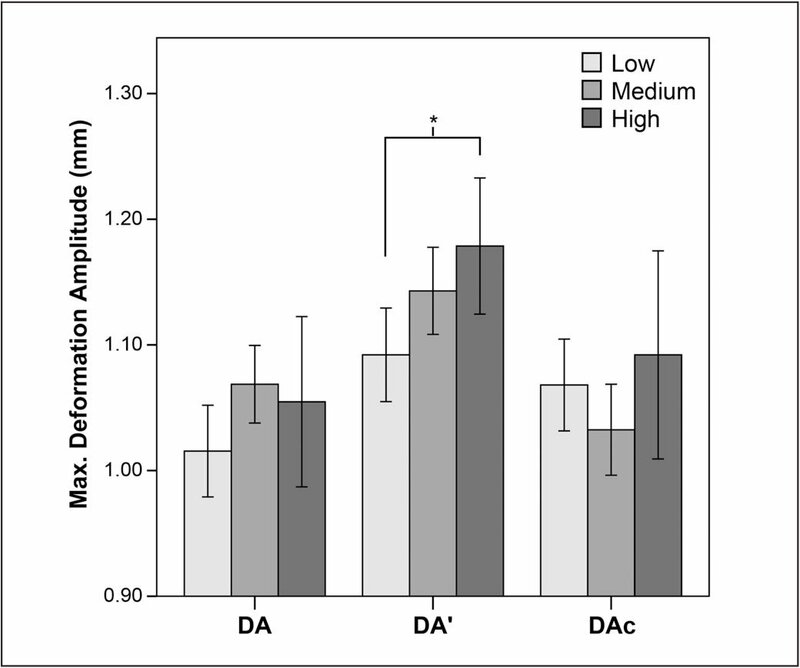 The refractive error treated was correlated with DA' but not with DA and DAc (Table A). Comparison between myopic groups is shown in Table B and Figure 2. The groups showed no differences in DA before SMILE (P = .096); significant differences were presented in DA', but only between the low and high myopic groups, as revealed in the post hoc comparison (P = .03). Furthermore, there were no statistically significant differences in the DA between myopic groups for the corrected postoperative SMILE value (DAc) (P = .47). The proposed index d was −1.23 ± 1.39 (range: −5.10 to 1.67) and no significant differences were found among myopic groups (Table B). Maximum deformation amplitude depending on the preoperative refractive error before small incision lenticule extraction (SMILE) (DA), after SMILE (DA'), and after SMILE subtracting the removed corneal thickness (DAc). Significant differences were only found between low and high myopia for DA' (P = .03). The cornea is a viscoelastic tissue; thus, its behavior is different during the loading and unloading pressures of an air puff.26 This is shown in our study in which AT2 was lower than AT1, indicating that the cornea needs more pressure to achieve AT1 than that required during the recovering stage at AT2; this difference of pressures between applanation times is called corneal hysteresis.20 Corneal hysteresis has been defined as a descriptor of the corneal viscoelastic properties, arguing that if the cornea were purely elastic, these two pressure values would be the same.26 On the other hand, AT1 only describes the elastic properties because a fast applied load, as in the case of the air puff, will result in an almost pure elastic response during the loading.24 Our results show that SMILE leads to an anticipation of AT1 and a retardation of AT2, indicating major resistance during the inward stage and greater force of the cornea during the outward recuperation before surgery. On the other hand, highest concavity remained constant after SMILE, which suggests that highest concavity mainly depends on the time at which the top pressure of the pulse is achieved. It has also been pointed out that corneal hysteresis is a meaningless parameter and the drop in pressure observed between the two applanation times cannot be linked to viscous properties of the stroma and can be attributed to the inertia.31 According to the latter, our results would describe a change only in the elastic properties of the cornea, which affect AT1 and AT2 in a similar way. However, we found that change in AT1 (diffAT1) was different among refractive error groups but this did not happen for the change in AT2 (diffAT2). Therefore, change in corneal thickness has a great impact on AT1, as also shown in the correlation analysis between AT1 and CCT before and after surgery, but not in AT2. The new indexes (t1 and t2) proposed in this study for comparison of refractive surgery procedures consider the change in applanation times depending on the removed CCT. Thus, the differences between refractive error groups for AT1 disappeared for the t1 index, demonstrating that this variable should be corrected according to the CCT removed. Our results about correlations between times and CCT are not completely in agreement with those obtained in other studies, in which AT2 and CCT have shown significant correlations in healthy eyes.32,33 However, the significance in correlations for AT2 and CCT in these studies were P = .043 and .031, considerably higher than for AT1 and CCT (P < .005), which also demonstrate higher dependency of AT1 with CCT. Therefore, it is possible that the discrepancy with these studies is due to the sample size or the statistical analysis. Corneal finite element model has demonstrated that corneas with different stiffness can show the same DA depending on the IOP and CCT.24 In our study, we assumed that IOP remains constant after the procedure because the same eyes were compared before and after SMILE. Therefore, changes in DA after SMILE should be mainly due to changes in CCT or corneal stiffness. We hypothesized that DA is increased after SMILE, mainly due to a change of thickness, considering that for the same deformation at the posterior corneal surface, the anterior surface is going to experience a greater depth due to the removed CCT. Under this hypothesis, we computed a new variable DAc by means of subtracting the DA' from the removed CCT. Thus, although DA was significantly increased after SMILE, no significant differences were found between the DA and DAc, which means either SMILE does not affect the corneal stiffness or the Corvis ST cannot detect little changes in corneal stiffness by means of the air puff. The index d did not show statistically significant differences among groups such as DAc. Our research may have limitations. First, postoperative measures were taken only 1 month after surgery and even though Mastropasqua et al.34 reported no significant differences between 30 and 90 days for variables such as AT1, AT2, or DA, we believe that higher CCT after SMILE than before surgery might be explained by a slight increase of corneal thickness by the postoperative dexamethasone treatment. Furthermore, the reason for other outliers that were eliminated from the sample might be due not only to postoperative treatment but also to a poor quality of the measurement considering that we only took one measurement per eye. The indexes that we proposed for comparison with other techniques in future studies should also be interpreted with caution. Although they consider the relative change in the Corvis ST parameter according to the change in thickness that supposes an advantage for procedures comparison, the standard deviation of these indexes is considerably high overall in the low myopic group. It is possible that studies with longer follow-up and larger samples will reduce the bias and the precision of these indexes will increase. Studies that have compared the Corvis ST variables among different procedures have not generally found differences between them.5,12 In our opinion, studies comparing Corvis ST variables without information about the preoperative values should be interpreted with caution because confounding variables such as IOP or CCT can have a high impact on the results.24 Therefore, future studies comparing techniques should include preoperative and postoperative data. We have proposed three indexes (t1, t2, and d) for future comparisons between different refractive surgery techniques. These can only be applied in paired studies that include preoperative and postoperative data assuming that the IOP of the patients remains constant after the procedure. We decided to use these indexes, based on relative ratios, because they represent the amount of change in a Corvis ST variable depending on the removed CCT. Thus, laser refractive surgery procedures can be compared by the amount of change in a Corvis ST variable that cannot be explained by a variation in corneal thickness. A technique with a higher index would represent a cornea with a poorer preservation of the corneal biomechanical properties because for the same removed thickness there would be a higher change in the Corvis ST variable. To the best of our knowledge, no other studies have considered and evaluated the relative change in Corvis ST variables according to the removed CCT. Therefore, our approximation is the first to solve this problem and we believe that might improve the studies for comparison between refractive surgery techniques until complex models for correcting Corvis ST variables depending on CCT are developed. We have demonstrated that if the Corvis ST parameters of time and DA represent the biomechanical properties of the cornea, SMILE affects the corneal biomechanics because these parameters change with surgery. However, we have also demonstrated that these changes are mainly due to the removed corneal thickness. When this variable was corrected, differences between myopia groups were not found and DA was equal to the preoperative values. Thus, CCT correction might help to recognize variations in corneal biomechanics due to flap generation or the stiffness characteristics of the tissue preserved instead of the volume of tissue removed. For this purpose, we have proposed new indexes based on the relative change of Corvis ST variables according to the removed CCT. These may help to improve studies of comparison between refractive surgery techniques for answering the hypothesis of better preservation of corneal biomechanics in SMILE that cannot be answered in this study. Similar studies are required with other laser refractive surgery techniques. Future improvements in Corvis ST parameters should be directed to correct the corneal thickness confounding variable and comparison studies between refractive surgery techniques should be based on differences between preoperative and postoperative values to minimize the bias produced by other confounding variables such as the IOP. Randleman JB, Grossniklaus HE, Dawson DG, McCarey BE, Edelhauser HF. Depth-dependent cohesive tensile strength in human donor corneas: implications for refractive surgery. J Refract Surg. 2008;24:S85–S89. Bischoff M, Strobrawa G. Femtosecond laser keratomes for small incision lenticule extraction (SMILE). In: Sekundo W, ed. Small Incision Lenticule Extraction (SMILE): Principles, Techniques, Complication Management, and Future Concepts. New York: Springer; 2016:8. From the Department of Ophthalmology (Qvision), Vithas Virgen del Mar Hospital, Almería, Spain (JF, MR-V, JM, AT); the Department of Optics, Pharmacology and Anatomy, University of Alicante, Alicante, Spain (DPP); and the Department of Ophthalmology, Vithas Medimar International Hospital, Alicante, Spain (DPP). Dr. Fernández is a consultant for Carl Zeiss Meditec. The remaining authors have no financial or proprietary interest in the materials presented herein.